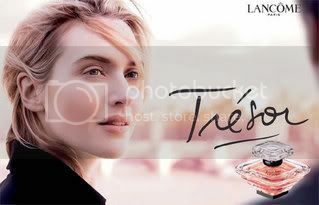 It was just a few days ago that Perfume Shrine was talking about revamped ad campaigns, inspired by the news that Kate Winslet, the quintessential English Rose of tremendous thespian abilities had been chosen to represent the almost classic fragrance by the house of Lancôme, Trésor. I always thought she would bring pathos and freshness in anything commercial she might touch, remembering her in such roles as the romantically exalted Marianne in Sense and Sensibility or the outwardly rebellious, inwardly sensitive Clementine in the Eternal Sunshine of the Spotless Mind". Even for a quite heavy handed composition as the original Trésor eau de parfum by Sophia Grojsman, a fragrance that first appeared in 1990 to subsequent throes of overpopularity that made it a little banal. Perhaps now is the time to lure in new customers who will see it with virginal eyes. For your delectation, here are the first pics that have been sleuthed for you. Enjoy!